After the now-traditional August break in the championship, the teams returned to action for the increasingly popular Turkish GP. Now in its third year, the new track has become a favourite with the teams and drivers. It's challenging layout provides not only a bravery contest around turn eight, but also a challenge in accuracy through the slow complex ending the lap. The extremely hot summer being experienced in southern Europe made the track's already challenging layout even tougher, especially for the tyres and engines. Now scheduled quite late in the season, Turkey usually features a lot of car upgrades - the track's similarity to the season-closing Japanese, Chinese and Brazilian circuits make it an ideal place to debut the last of the current car's developments. This time around though, races preceding Turkey have featured several upgrades, and the expected Spyker B-spec car did not appear. Thus, there were fewer developments than expected. Irrespective of the slower corners, it is good high-speed aerodynamics that are needed to be fast around the Istanbul track. The car and tyres have to work hard around the sweeping curves opening the lap, the four-apex turn eight and also through the kink on the back straight. Yet the car still has the long straights and braking into the slower corners to contend with. Thus, the cars are in a typical medium-downforce guise and sprung stiffly to keep the cars' underside flat to the track for maximum efficiency. As the track has long corners, the drivers are constantly seeking a better balance to make the most of the grip the car has available. This balance will pay off in the race, as a balanced car is easier to drive and easier on its tyres. The extremely high track temperatures this year also made life difficult for the rubber. Bridgestone arrived with its medium and hard compounds to cope with the stresses of the fast corners and heat. For the first time the teams were quite divided in their preference for the harder or softer tyre. Ferrari chose to race with the medium tyre, only running the harder tyres at the end of the race. McLaren, however, did the opposite, and again Alonso chose the harder tyre for his last qualifying run. It seems many drivers were taking too much out of the tyre on their qualifying lap, leaving little grip for the final slower corners. Therefore, many drivers chose to run a very slow out-lap to preserve the tyre, whereas Alonso reckoned on the harder tyre lasting better. In the race, many drivers suffered 'chunking'. This where the tyre picks up some of the marbles off the dirty line around the track. The colder marbles stick to the hot tyre, which reduces the tyre's grip. The chunks tend to wear off naturally, but sometimes they can accumulate and then tend to be thrown off, taking some of the tyre's rubber with it. 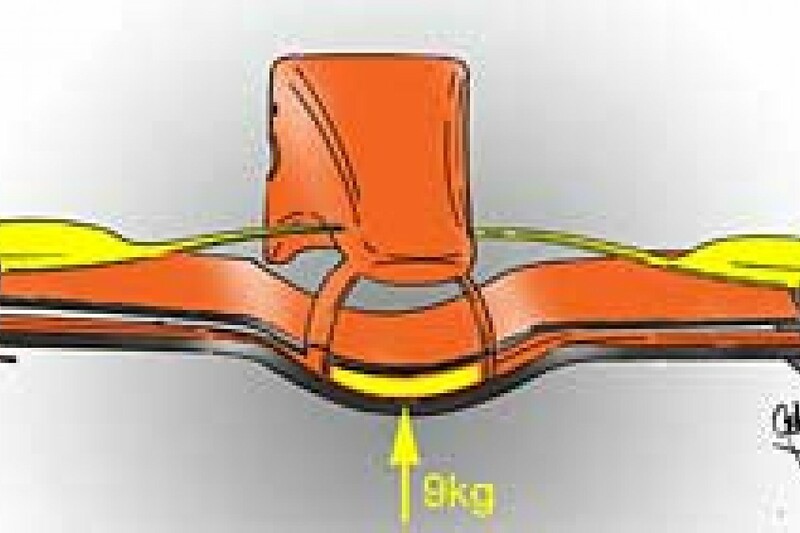 In Lewis Hamilton's case during the race, the chunking reached a stage where the tyre delaminated, ripping a strip off the tyre. Having stated that some 50 percent of the team's now considerable development resources are focused on the 2008 car, BMW Sauber arrived with a neat new detail on the F107. 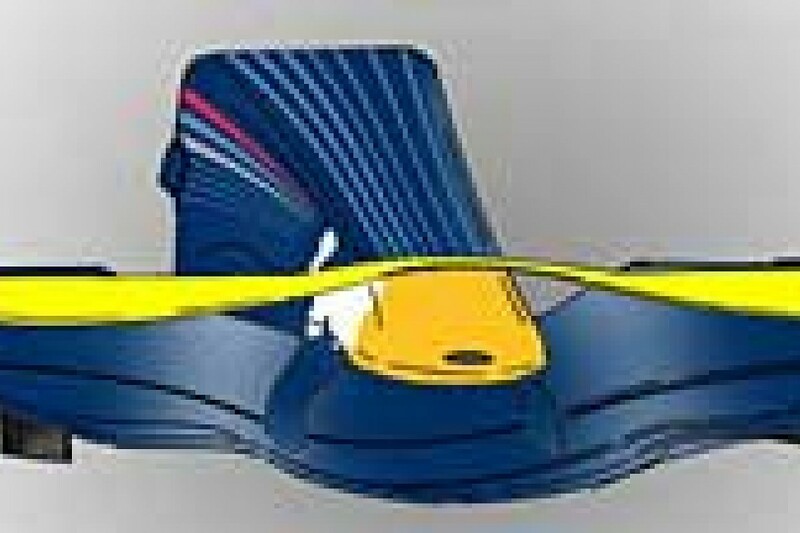 The bargeboards have received a small vertical vane (yellow). Like many teams, the BMW Saubers sport two horizontal fins on the trailing edge of their main bargeboard. These add downforce, as well as having some effect on routing the flow around the sidepods. Some other teams use vertical fins to route the flow around the car. The new element provides the best of both worlds. Having signed ex-Honda technical director Geoff Willis, who was seen in the Red Bull pits for the first in Turkey, the team are still pressing on with aero development, in light of the developments seen at the preceding races (engine cover and rear wing). Their new development is yet another McLaren-inspired idea. However, this is one that may predate Adrian Newey's time at McLaren. Red Bull adoption of the McLaren-style bridge wing makes sense in that the Red Bull has a similarly low nose profile. The previous Red Bull bi-plane wing element twisted down to meet the nose cone, but in the new configuration this is avoided and provides some useful wingspan to create downforce and/or condition the flow over the front of the car. The dramatic-looking upper wing is mated to a new three-element lower wing. The wing has a completely different span profile to the previous Red Bull wing. The centre section is flatter, with pronounced flick-ups at the outer tips. This shape has been widely adopted this year - in Red Bull's case, the less aggressive profile is potentially more efficient and makes less downforce, but the new upper wing offsets some of the loads lost by the lower wing. This philosophy of an upper wing to create downforce and allowing the lower wing to be more lightly loaded improves the flow over and under the rest of the car. This makes the rear wing and diffuser work better, allowing the car to run less drag overall. Having been testing the B-spec chassis at Silverstone with some success, the team were unable to run the car at Turkey as planned as the new rear impact structure failed its crash test. This came as a blow to the team, who had already pushed back the car's original launch from the European GP to the Turkish race. As the B-spec car is largely a revised rear end, comprising rear suspension and gearbox casing, the car required a revised crash structure. This forms part from the car's primary crumple zone in case of a rear-end crash. The carbon fibre structure mounts to the rear of the gearbox around the differential case, and extends back to mount the rear wing. Often this component is used to mount some of the suspension members, such as the rear toe link. A large part of this structure's shape is now dictated by the FIA rules, as regards cross section and height. It comes as something of a surprise that the new component could fail the crash test. Notwithstanding the team being unable to run the complete B-spec car, Spyker did run a new development on the front wing. The endplates and cascades have been replaced with new parts, forming a full-width bi-plane element, but stopping short of the McLaren/Red Bull bridged format. Being at the front of the car, the new wing could be run beneficially without the complete B-spec rear end. One sign that the team's B-spec development work will pay off is that new front wing has space for ballast to be installed in the middle of the front dipped section. Teams have tended to move their weight distribution forward this year to suit the Bridgestone tyres, which demand more load over the front tyres. The need to run a forward weight bias is limited by their ability either to 'design in' the required layout, or to run enough ballast in the right places. The option of running ballast is down to having the basic car under the weight limit to run enough ballast, and also to having space available in the right places to install the bulky ballast. The compartment on the new Spyker wing has a tell-tale 9kg sticker on it. In order to keep their V8 engines cool, Toyota brought their usual array of cooling options for the car. For the race, the team adopted extra grills on the sidepods, while the usual vented panel around the exhaust now sported a larger fairing. These cooling fairings were popular with the old V10 engines, but have gone out of vogue with the V8. This is due to the smaller capacity engine having a lower heat output, and also the drag penalty of these fairing is less favourable with the lower power engine. Toyota is the sole team running this style of hot air outlet. 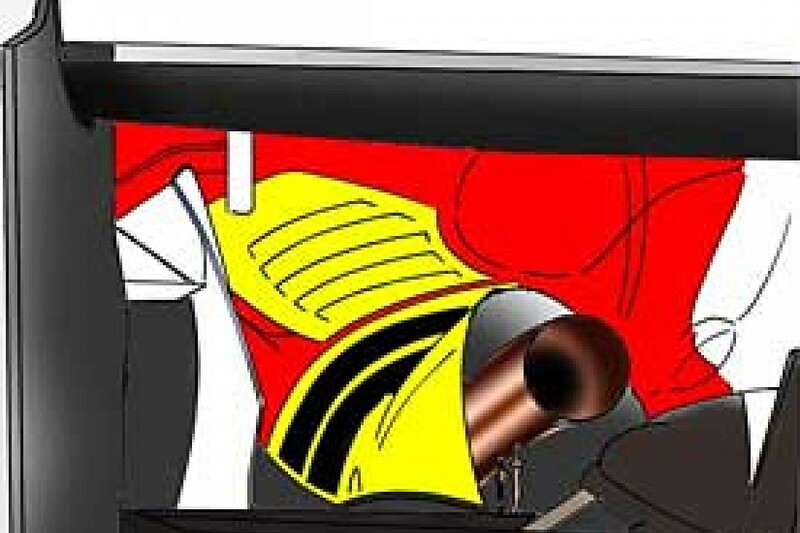 Toyota also retained the option to provide cooling by opening up the sidepod below the main flip up, but the three outlets provisioned along the flank are rarely used.